Pat's Scraps: DCD Challenge #154-It's Mardi Gras! Make a Mardi Gras inspired project (music, beads, masks, bright colors, parade, etc.) Anything that makes you think of Mardi Gras. This one was quite a challenge for me, but I came up with this jester's cap made with Recollections Primary Pin Dot Cardstock papers. Aren't they the greatest?! Love these lively colors. The pom-poms are finished with orange stickles. The sentiment comes from Cricut Birthday Cakes and was cut at 2" with a shadow. Added some punched stars for a fun feel! I hope you like my card. Now it's your turn to give this challenge a try. Make something that is inspired by the look and feel of Mardi Gras, or anything Mardi Gras related. 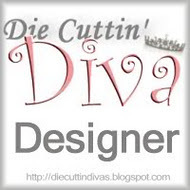 Be sure to use a die-cut and link your post back to the Die Cuttin' Divas blog site. How super AWESOME is this Pat! Such a GREAT card! OMG!! I love this Pat!! OMG! I love the bright fun colors Pat!! Fun card. Super adorable card! Love the papers you used!! Have a great day. Love this Hat with the patterned paper. Pat your Mardi Gras card is so cute, love the polka dot papers!